For the word of God is living and powerful, and sharper than any two-edged sword, piercing even to the division of soul and spirit, and of joints and marrow, and is a discerner of the thoughts and intents of the heart (Hebrewa 4:12 NKJV). Below are scriptures from the New Testament (the words in Italics are mine) that describe sin. Almost anybody who reads these passages of scripture will feel convicted at one or more of these transgressions against God. The only answer is to repent. If you have not been born again, that is obeyed the Gospel of Jesus Christ, you can use this repentance as a launching point to your salvation. You can go to "Do You Want To Go To Heaven?" to understand salvation. 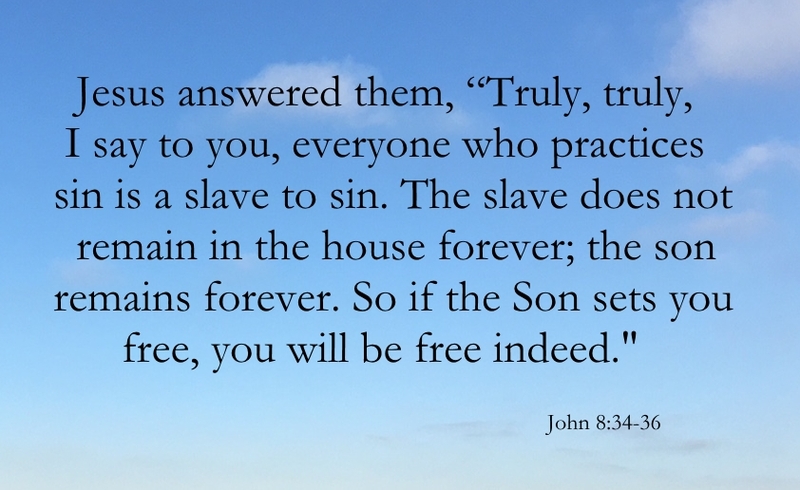 On the other hand for those who have been born again (including me), we must repent of these sins that God has convicted us of, and correct the course we are on by eliminating them from your life. Here are the passages describing "What is sin?" For from within, out of the heart of men, proceed evil thoughts, adulteries, fornications (sexual immorality), murders, thefts, covetousness, wickedness, deceit, lewdness (lustful desires), an evil eye, blasphemy, pride, foolishness. All these evil things come from within and defile a man (Mark 7:21-23 NKJV). Therefore whatever you have spoken in the dark will be heard in the light, and what you have spoken in the ear in inner rooms will be proclaimed on the housetops (Luke 12:3 NKJV). And whenever you stand praying, if you have anything against anyone, forgive him, that your Father in heaven may also forgive you your trespasses (Mark 11:25 NKJV). For this reason God gave them up to vile passions. For even their women exchanged the natural use for what is against nature. Likewise also the men, leaving the natural use of the woman, burned in their lust for one another, men with men committing what is shameful, and receiving in themselves the penalty of their error which was due (homosexuality) (Romans 1:26-27 NKJV). And even as they did not like to retain God in their knowledge, God gave them over to a debased mind, to do those things which are not fitting; being filled with all unrighteousness, sexual immorality, wickedness, covetousness (greed), maliciousness (hate); full of envy, murder, strife, deceit, evil-mindedness; they are whisperers, backbiters, haters of God, violent, proud, boasters, inventors of evil things, disobedient to parents, undiscerning, untrustworthy, unloving, unforgiving, unmerciful (Romans 1:28-31 NKJV). Do you not know that the unrighteous will not inherit the kingdom of God? Do not be deceived. Neither fornicators (sexually immoral), nor idolaters, nor adulterers, nor homosexuals, nor sodomites, nor thieves, nor covetous (greedy), nor drunkards, nor revilers (abusers), nor extortioners (cheat people) will inherit the kingdom of God (1 Corinthians 6:9-10 NKJV). Now the works of the flesh are evident, which are: adultery, fornication (sexual immorality), uncleanness (impurity), lewdness (lustful pleasures), idolatry, sorcery (witchcraft), hatred, contentions (quarreling), jealousies, outbursts of wrath (hostility), selfish ambitions, dissensions, heresies (division), envy, murders, drunkenness, revelries (wild parties), and the like; of which I tell you beforehand, just as I also told you in time past, that those who practice such things will not inherit the kingdom of God. (Galations 5:19-21 NKJV). Therefore put to death your members which are on the earth: fornication (sexual immorality), uncleanness (impurity), passion (lust), evil desire, and covetousness, which is idolatry. Because of these things the wrath of God is coming upon the sons of disobedience (Colossians 3:5-6 NKJV). Therefore, putting away lying, “Let each one of you speak truth with his neighbor,” for we are members of one another. “Be angry, and do not sin”: do not let the sun go down on your wrath (rage), nor give place to the devil. Let him who stole steal no longer, but rather let him labor, working with his hands what is good, that he may have something to give him who has need. Let no corrupt word (foul or abusive language) proceed out of your mouth, but what is good for necessary edification, that it may impart grace to the hearers. And do not grieve the Holy Spirit of God, by whom you were sealed for the day of redemption. Let all bitterness, wrath (rage), anger, clamor (harsh words), and evil speaking (slander) be put away from you, with all malice (types of evil behavior) (Ephesians 4:25-31 NKJV). But know this, that in the last days perilous times will come: For men will be lovers of themselves, lovers of money, boasters, proud, blasphemers (scoffers of God), disobedient to parents, unthankful, unholy (nothing is sacred), unloving, unforgiving, slanderers, without self-control, brutal (cruel), despisers of good (hate what is good), traitors (betray friends), headstrong (reckless), haughty (puffed up with pride), lovers of pleasure rather than lovers of God, having a form of godliness but denying its power. And from such people turn away! For of this sort are those who creep into households and make captives of gullible women loaded down with sins, led away by various lusts, always learning and never able to come to the knowledge of the truth (2 Timothy 3:1-7 NKJV). Therefore, to him who knows to do good and does not do it, to him it is sin (James 4:17 NKJV). And let us consider one another in order to stir up love and good works, not forsaking the assembling of ourselves together, as is the manner of some, but exhorting one another, and so much the more as you see the Day approaching (Hebrews 10:24-25 NKJV).